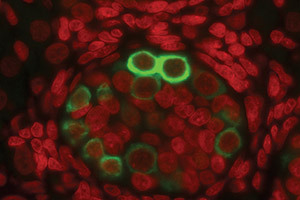 UCLA Broad Stem Cell Research Center/Male prenatal germline cells stained in green. UCLA scientists examining causes of human infertility have found that the cells that create eggs or sperm during the prenatal stage of development are vulnerable to damage, according to new research published today. The study by Amander Clark, of the UCLA Eli and Edythe Broad Center of Regenerative Medicine and Stem Cell Research, was published in the journal Cell. Clark said that the findings advance the understanding of human germ cells, which are responsible for carrying parents’ genes to a child. Abnormalities in the germ cells can cause infertility as well as diseases such as germ cell tumors in young boys and primary ovarian insufficiency in young girls. The genetic information in all healthy cells is protected by a process called methylation, which acts as a coat on the genome that safeguards cells from mutations. Methylation removal happens infrequently in the human body, but one such time is during the prenatal stage of pregnancy. Clark’s study recorded the amount, duration and location of demethylation in prenatal germ cells from 53 to 137 days of development. The study, which was supported by grants from the National Institutes of Health and the California Institute for Regenerative Medicine, as well as the UCLA Broad Stem Cell Research Center, found that the human germline erases almost all evidence of genome methylation by 113 days of prenatal development.